HULK'S SENSE OF HULK WORTH NOT DEPENDENT ON BELITTLING OTHERS. HULK IMPRESSED BY EMPATHY, NOT COMPETITIVE COOLNESS. What happens far less, but something I believe will begin to happen more (and has been part of several projects I’ve seen), is original or newly created fictional characters inhabiting social and web spaces. Penguin used Twitter and blogs to tell Slice, one of the stories in their We Tell Stories experiment. btw It wasn’t a rabbit, it was a hare. Jacomo and he's amazing. Be nice to hares, they are more important than you know. Which brings me to the IMF Dublin Diary a twitter and blog creation of another Twitterer and blogger, The Mire. That word creation is the important word, because this is creation, it is art in the true (if un-stuffy) sense. The imagined thoughts of the IMF’s (not) pointman in Dublin, it is rich satire and high comedy (though dark given its content) and what is more it uses the medium very well. You could argue that all it does is take an old idea and transfer it to a new medium and while that’s true, I think it does it very well. The execution is precise and measured, the tone feels right and the reflections on Irish society, ministers and civil servants have, at least for those of us living through what are strange and interesting times, a ring of truth, along with a splash of whimsy and a sprinkle of insanity. Lots of publishers have been rolling out new media and social media strategies and yet they are failing to do really basic things. There are some VERY simple things that can improve your site immeasurably and help you promote your company and your website. 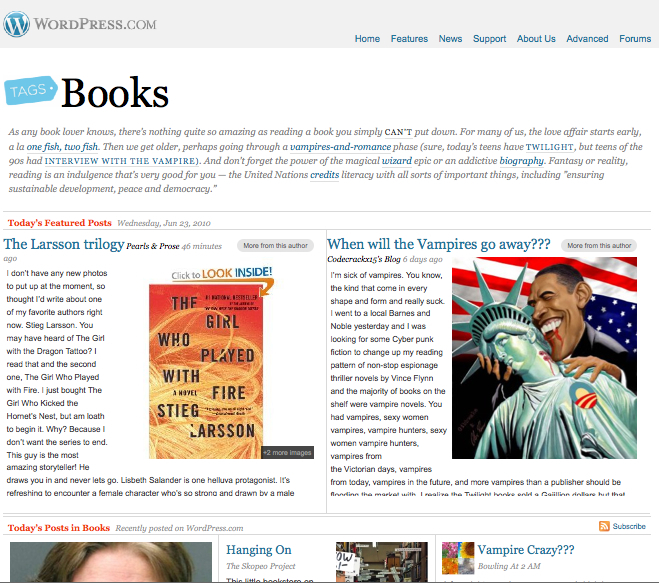 The crazy thing about these are that Big and Small publishers all fail to do them. And they are effectively free! This one though has been annoying the hell out if me recently. And it’s so easy! You could set your news page up as a blog and allow commnets, but even if that isn’t for you, it is non-sensical to have a news page without an RSS feed. News that you post to a static news page just sits there waiting for people to come to it. An RSS feed sends it OUT to people in the place they have decided to READ It. That’s a wonderful permission tool. They are LOOKING for your news when they subscribe to your news RSS. 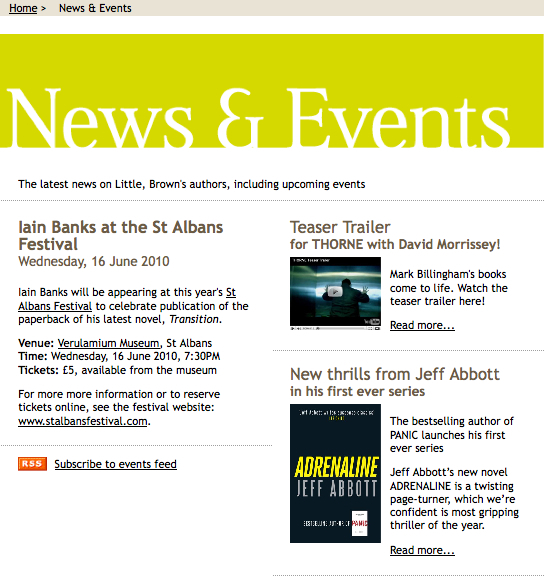 The Mercier Press News Page is a good example of using an RSS feed to a) let people know what’s coming up and b) getting pictures and news out about book launches and pretty much anything else. If they do anything wrong it’s that they don’t TELL people you can subscribe, I’d change that. My idea of perfection for this is Little Brown’s UK website where they have an RSS Feed for their News & Events page AND they promote it! * For New Pages, read Press Release or Update or whatever you prefer to call it! Some time ago, while I was still working at Mercier Press, probably back in early 2008 in fact, I read a submission. It was for a book by a young man called Kieran Mark Crowley. The pitch was great, the text was zingy and the whole thing just read exceptionally well. I met Mark, liked, him, pitched the book at the new title meeting and before we knew what was happening, Colm & The Lazarus Key was published and on bookshelves (complete with a rocking cover by the wonderful Snowbooks folks). Last week the shortlist for the 20th Bisto Children’s Book of the Year Awards was announced and Kieran’s wonderful book was one of the ten books chosen for that shortlist. 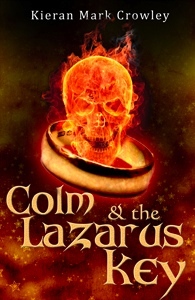 I’m delighted because I honestly believe that Kieran has many more fine books in him and that Colm & The Lazarus Key is one of the finest Irish children’s debut novels for some time. Check out Kieran’s website or read an interview with him over at Mercier’s site. And buy and read the book! Having a decent evening, but thinking about Great Aunts and Apple Tarts.